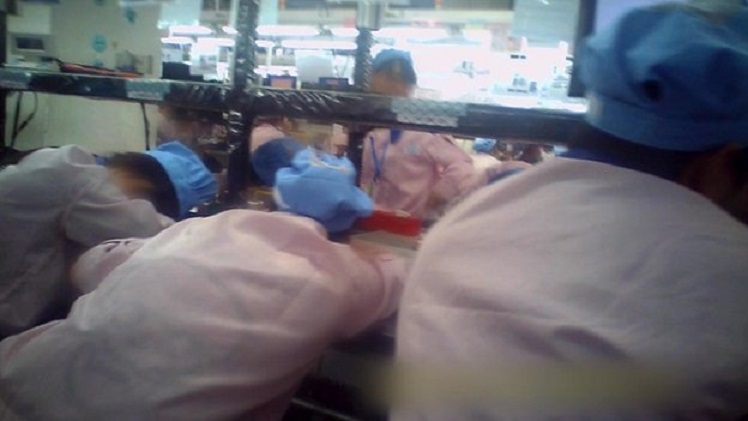 LOOK: Undercover Video Shows Apple Uses Chinese Sweat Shop To Make Your IPhone. BBC News went undercover in a Chinese factory that makes Apple products and what they found will disgust you. Apple’s promise to protect Chinese workers has been a complete lie! This video below filmed in an iPhone 6 production line shows the unbearable conditions these workers are put under. It found the standards on worker’s hours, ID cards, dormitories, work meetings and juvenile workers were being breached at the Pegatron factories. Exhausted workers were filmed falling asleep on their 12 hour shifts at the Pegatron factories on the outskirts of Shanghai. However, actions speak louder than words. According to this video, it looks like Apple is putting profits above human safety.